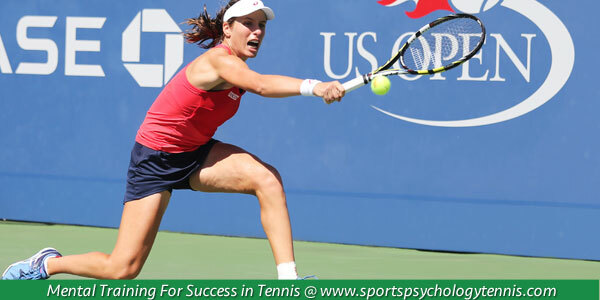 Do you have drastic fluctuations in tennis matches due to distracting thoughts? 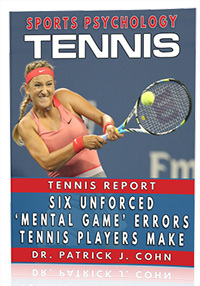 Do you find it difficult to just play your game and focus on your tennis? 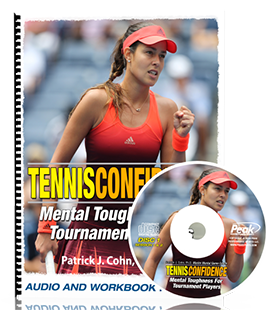 Your mindset during tennis matches is critical for achieving peak performance. Mindset is how you approach the game of tennis including your attitude, belief in your abilities and response to adversity. Many coaches talk about competitive mindset but fail to define the optimal state for performance or how to get into that optimal zone..
Ruth Anderson et al. researched the optimal state, or mindset, for achieving peak performance by interviewing World Class and Olympic athletes. In “Investigating the optimal psychological state for peak performance in Australian elite athletes (Journal of Applied Sport Psychology, 2014),” the researchers determined the “automatic state” is optimal for performing at peak levels. The automatic state is what tennis players and coaches refer to as “just playing” tennis. lack of trust in your abilities, etc.. The researchers identified several critical elements needed to for athletes to achieve the optimal automatic state for athletes to perform at their best. Self-Awareness – Recognize what you are thinking (cognitions), feeling (emotions) and what you are doing (behaviors) in order for change to occur. Trust – Trust your abilities so you can execute during performance without over-thinking. Resiliency – You must be able to cope and adapt to the pressure and stressors in competition. Follow a consistent routine prior to a match and before each point. Focus on what you need to do. Ruminating about internal thoughts or emotions or external conditions (crowd, opponents, officiating, etc.) are distractions that negatively affect your tennis. Develop the ability to direct your focus on the present moment (this point). Take control of your thinking and re-direct your thoughts when negative thoughts arise. Keep it simple. Don’t complicate matters with over-thinking technique or results. Tip #1: You need to take control of your thinking. The first step includes becoming aware of what you are thinking and then consciously re-direct your thoughts to more productive thoughts. That doesn’t mean you can’t have any negative thoughts. Everyone has them. Just re-direct your thoughts to what you need to do right now. Tip #2: You should develop a specific consistent routine prior to a match and before each point. A consistent routine will help you focus your attention on what really matters and prevent over-thinking.